Rent Echostage | Corporate Events | Wedding Locations, Event Spaces and Party Venues. Washington Dc's largest concert venue! The place has already attracted industry heavyweights such as David Guetta, Calvin Harris, Avicii, Armin van Buuren, Hardwell, Tiesto, and many more. Top tier sound design, advanced LED visual displays and unobstructed sight lines throughout the venue provide an atmosphere unmatched on the east coast.Two 60 ft. bars run along each side of the dance floor and a photo pit provides close-up views in front of the stage. The back of the room features a raised “front of house” booth where a team controls the show. Stairwells in the back corners of the dance floor lead to VIP. Mezzanines over-looking the dance floor. Each houses a bar and each bottle service area comfortably accommodates 8 people. A smoking area exists in front of the venue with access coming from the back corner of the main floor next to the merchandise stand. women’s bathrooms are located on each side of the dance floor through hallways that allow for easy crowd flow. 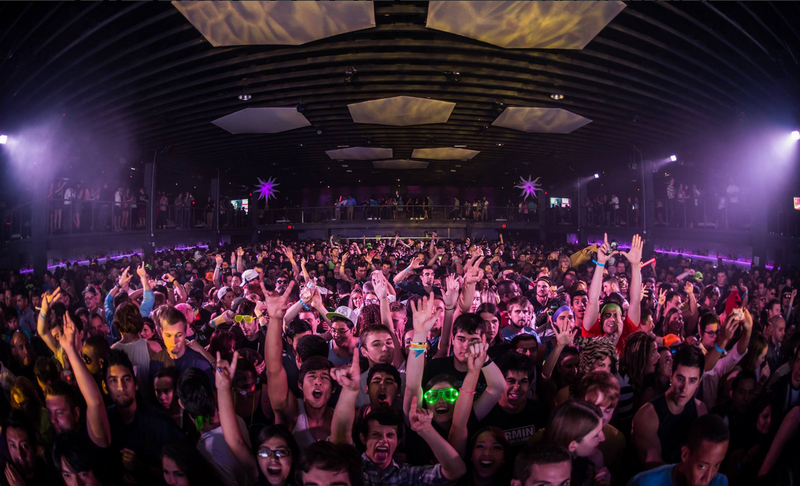 While the bulk of Echostage events involve Glow’s massive dance music DJ-events, the venue was renovated to be an all purpose venue made to host live bands, MC’s and any other event requiring a large-scale stage production--perfect for large scale events.